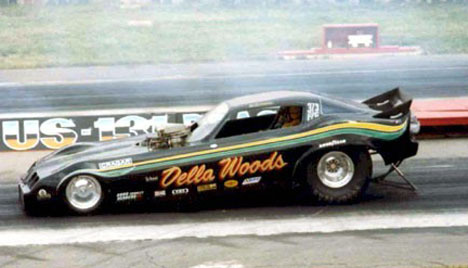 Bob Gottschalk, the 1982 NHRA Top Alcohol Funny Car champion, made the leap into nitro funny cars in 1983. 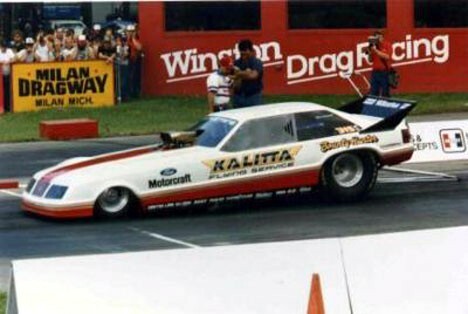 The transition from a blown alcohol Donovan to a blown nitro Keith Black was not a smooth one for Gottschalk. 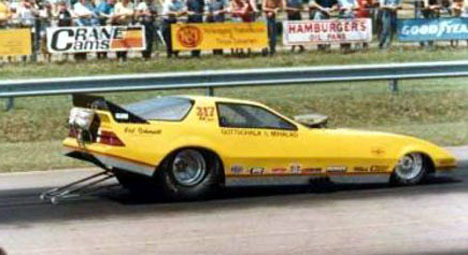 Bob raced AA/FC from 1983 to 1986 without much success. The end of the road for this Camaro came in 1985 as Gottschalk experienced one of the worse fires ever seen. The fire started on the big end at Gainesville and off into the woods Bob went. The blaze burned 50 acres of Florida pines before it was over. 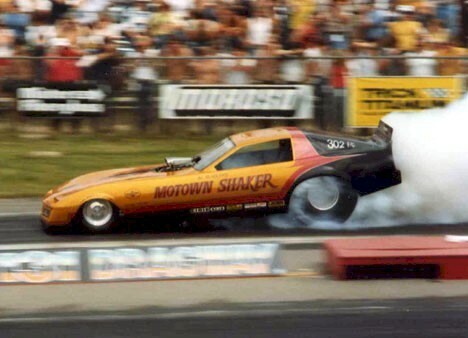 After years of racing under-funded Top Fuelers and AA/Funny Cars, Ron Correnti got his chance at a major nitro ride. 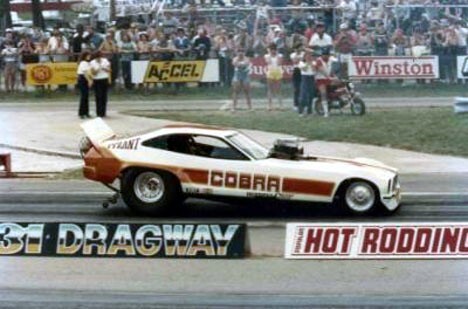 Bill Dunlap was one of racing’s most free spirited owners, but he did not race junk. 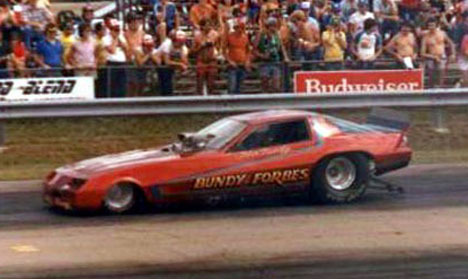 Dunlap began racing the ‘Capt. Crazy’ AA/FC in 1984 after a very successful TA/FC career. Drivers like Gary Southern and Paul Smith drove the machine first, but in mid-85, Bill hired Midwest racer Ron Correnti to shoe the car. 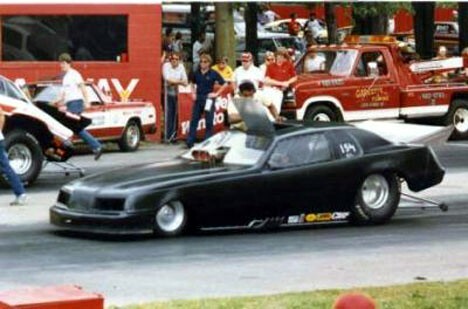 In late 85, Dunlap built the first Thunderbird funny car, but good luck was not in the works for the Capt Crazy T-Birds. 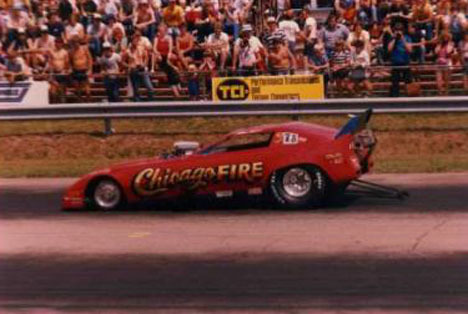 Correnti had a major fire at Edgewater, Ohio, in late ’85, destroying the first Thunderbird. A new Thunderbird was built but it, too, was destroyed. 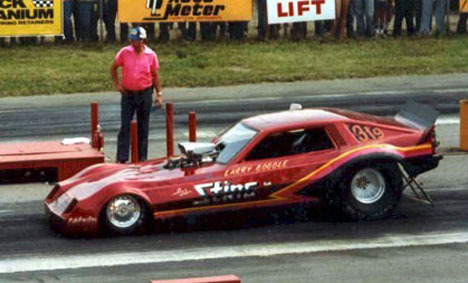 At the 1986 Winternationals, Correnti was T-boned by Dave Uyehara in the ‘Insanity’ Charger. 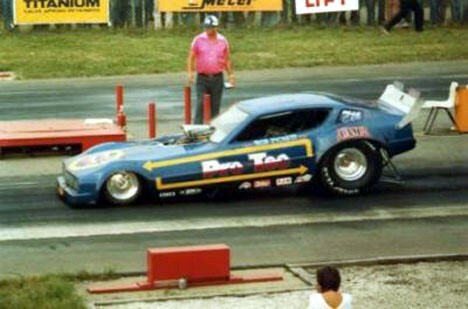 Ron ran a best of 5.77 at 253.59 in the Thunderbird. Dunlap returned that year with new driver Gary Phillips in a Chevy Cavalier sponsored by FCF Banking.